OMAHA (KPTM)- It has been a rough couple of years for one Omaha family. Their 3-year-old son was diagnosed with a rare form of eye cancer, and when their world seemed to fall apart their house did too. “When Eli was diagnosed in 2012, we had hopes to do things to the house but those obviously weren’t our priority anymore,” said Casie Haley. Haley and her family of five were in for a huge surprise Friday, when they pulled up to their newly remodeled home. 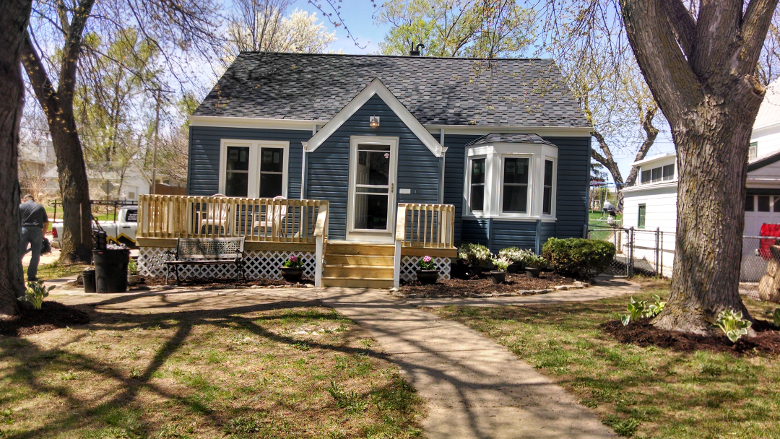 New siding and insulation, new gutters, a new roof, and a new porch were all added to Haley’s home, courtesy of Elite Exteriors. If the Haleys had paid for it themselves, it would have cost around $45 thousand. “Some people need a pick me up, and we’re happy to help with that,” said Rich Davidson. Davidson donated everything to help out the Haley family. He and a crew of 30 worked four and a half days to get the house ready for the family. “Everybody pitched in because it was the right thing to do,” said Davidson. “It means more to us than thank you can describe,” said Haley. Family and friends stood cheering Friday as the family took in their newly updated home, and Davidson could not stop smiling. “We’re just happy to be here, happy to help,” said Davidson. “We’ve had a hard year, so this is one of those moments that is good,” said Haley. She said she’s celebrating the good moments, like Eli going into remission, and her family getting to love and live inside her beautiful “new” home.